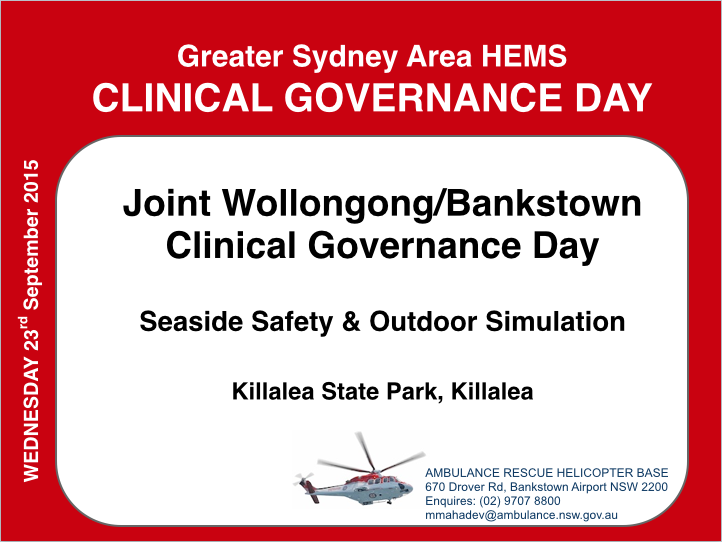 This weeks Clinical Governance Day sees the team from Bankstown trekking south to Killalea State Park to rendezvous with the Wollongong team for a joint-CDG focussing on seaside scene safety and the challenges of coastal rescue and resuscitation. Special thanks goes out to Wayne Cannon, Kent Robinson and the team at the Wollongong Base who have organised what promises to be a fantastic day of outdoor simulation. As you can appreciate – staff safety on the day is of upmost importance and as a result numbers have been limited to staff from both bases. Rest assured, our regular CDG program will be back up and running on October 7th.